Tom Holt writes comic fantasy. He also writes historical fiction about ancient Greece and Rome. Learn more at Tom Holt’s website. J.W. Wells & Co. — (2003-2006) Publisher: Starting a new job is always stressful (particularly when you don’t particularly want one), but when Paul Carpenter arrives at the office of H.W. Wells he has no idea what trouble lies in store. Because he is about to discover that the apparently respectable establishment now paying his salary is in fact a front for a deeply sinister organisation that has a mighty peculiar agenda. It seems that half the time his bosses are away with the fairies. But they’re not, of course. They’re away with the goblins. I've come late to the Tom Holt party, but I'm glad I finally made it. 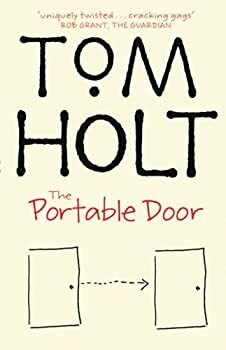 The Portable Door is the first book of his that I have read and I definitely intend to try more. The Portable Door is the story of Paul Carpenter, who takes a mysterious job in a mysterious firm where mysterious goings-on occur. I found it always interesting, a nice quick read, and lightly humourous. I wouldn't say there were many laugh-out-loud moments, but I chuckled more than once or twice! Polly is pretty sure she’s going crazy, or, at the least, senile. Not only has she agreed to attend a game of darts with her boss and coworkers, but also she has begun to find finished work that she could have sworn she hadn’t done. Worse, for any nine-to-fiver, weird things are happening with the coffee. 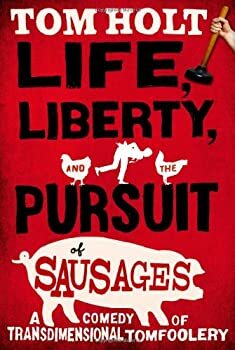 It may not sound like your run of the mill epic or urban fantasy, but Tom Holt is going to work magic into the plot of Life, Liberty and the Pursuit of Sausages somewhere. There aren’t any vampires or demons, but dry cleaners that once were on Clevedon Road can no longer be found, and now Polly doesn’t have a dress for the darts game. Theo Bernstein accidentally put a decimal point one place to the left instead of the right and, thusly, caused the Very Very Large Hadron Collider to explode, thereby disintegrating an entire Alp and becoming one of the most hated men alive. Coincidentally, Shliemann Brothers, the company that held all his investments, went bust at just about the same time, so, well, things aren’t going great for Theo. 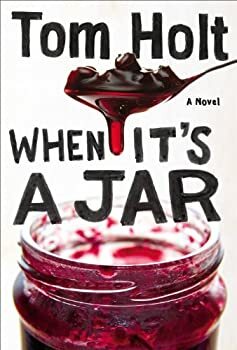 When It’s a Jar is Tom Holt’s sequel to last year’s Doughnut. 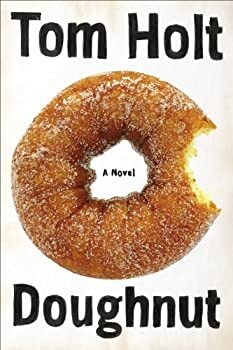 It can stand alone, but you probably want to at least read about Doughnut first (here is Stefan’s review). In Doughnut, physicist Theo Bernstein made a math error which blew up the Very Very Large Hadron Collider. Then from his friend, a famous physicist, he inherits a bottle which is a portal to the multiverse he never knew existed. Now he can travel to different parallel universes through the holes in doughnuts. Or bagels work, too. 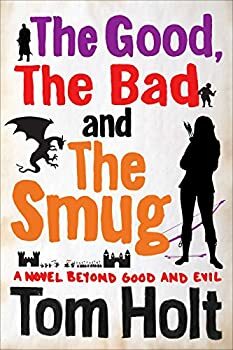 The Good, the Bad, and the Smug is the fourth novel in Tom Holt’s YOUSPACE series, following in the footsteps of Doughnut, When It’s a Jar, and The Outsourcerer’s Apprentice. Like those previous books, this one can be read as a stand-alone; there were recurring characters and running jokes which were enjoyable to this first-time reader, but which I suspect would have made more sense had I been more familiar with the rest of the series. Still, The Good, the Bad, and the Smug is a very pleasant way to spend a few afternoons. Flying Dutch — (1991) Publisher: It’s been 400 years since Dutch sea captain Cornelius Vanderdecker and his crew drank an immortality elixir that they mistook for beer. Now the compounded interest on a life insurance policy he took out in the 1500s makes him worth more money than exists in all the world… and he may be close to the end of his boring immortality. Faust Among Equals — (1994) Publisher: The management buy-out of Hell wasn’t going quite as well as had been hoped. For a start, there had been that nasty business with the perjurors. Then came the news that the Most Wanted Man in History had escaped, and all just as the plans for the new theme park, EuroBosch, were under way. Who’s Afraid of Beowulf? — (1988) Publisher: The last Norse king of Caithness, Hrolf Earthstar and his 12 champions are woken from a centuries-long sleep when an archaeologist finds their grave. He decides to carry on his ancient war against the Sourcerer-King, and must face such perils as BBC film crews and the Bakerloo line along the way. My Hero — (1996) Publisher: Novelist Jane Armitage is surprised when her characters begin writing back to her. She had no idea that besides the reality we are all aware of, there is a Realm of Fiction, where the literary characters are really actors, haunting a central casting agency looking for similar roles in new books. Jane’s troubles begin in earnest when she enters Fiction looking for Skinner, a writer trapped there decades ago, and-with the help of Hamlet, Piglet, Titania, and Holmes-uncovers a plot to merge Fiction and Reality. Divine Comedies — The cover of this book says that it contains Ye Gods, but both Amazon and Tom Holt’s website says it contains Odds and Gods. Ye Gods is contained in Tall Stories (below). Here Comes the Sun — (1993) Publisher: All is not well with the universe – cutbacks have taken their toll, and the sun is dirty and late, thanks to being 30 billion miles overdue on its next service. None of the committees can agree on anything, and extreme measures seem called for. Odds and Gods — (1995) Publisher: Wagner got it wrong. The twilight of the gods isn’t that cataclysmic. After all, there’s a comfy chair, a warm fire and three meals a day at the Sunnyvoyde Residential Home. Passing the time with Aphrodite, who’s still quite sprighty with the aid of her Zimmer frame, isn’t heaven – but it’s close. Expecting Someone Taller — (1987) Publisher: All Malcolm Fisher did was run over a badger. Unfortunately the badger turned out to be Ingolf, last of the giants. With his dying breath he reluctantly gave Malcolm two gifts of power and made him ruler of the world. Ye Gods! — (1992) Publisher: Being a Hero bothers Jason Derry. It’s easy to get maladjusted when your mom’s a suburban housewife and your dad’s the Supreme Being. It can be a real drag slaying fabulous monsters and retrieving Golden Fleeces from fire-breathing dragons, and then having to clean your room before your mom will let you watch Star Trek. But it’s not the relentless tedium of imperishable glory that finally brings Jason to the end of his rope; it’s something so funny that it’s got to be taken seriously. Deadly seriously. Overtime — (1993) Publisher: Guy, a World War II Mosquito pilot, is surprised when his dead co-pilot seems to start speaking to him as they fly over Northern France. And before long Guy is caught up in time and travel, a search for Richard the Lionheart, and a beautiful damsel. Grailblazers — (1994) Publisher: Fifteen hundred years have passed and the Holy Grail is still missing, presumed ineffable. The knights have dumped the quest and now deliver pizzas, while the sinister financial services of the lost kingdom of Atlantis threatens the universe with fiscal Armageddon. Paint Your Dragon — (1996) Publisher: One moment Bianca’s sculpture of St George is lacking just the final touches, the next, it’s lacking a dragon. This is only the first step in a fight between good and evil, involving some heavyweight gamblers, a time entrepreneur, a dragon, St George, and some hideous but endearing demons. Open Sesame — (1997) Publisher: Just because he is a character in a book, Akram the Terrible doesn’t see why boiling water must be poured over his head again. Meanwhile, Michelle gets a shock when she puts on her Aunt’s ring and her computer and television start to criticize her for past misdemeanours. Only Human — (1999) Publisher: Something is about to go wrong. Very wrong. What do you expect if the Supreme Being decides to get away from it all for a few days, leaving his naturally inquisitive son to look after the cosmic balance of things? A minor hiccup with a human soul and before you know it you’re on the road to chaos. Snow White and the Seven Samurai — (1999) Publisher: Once upon a time (or last Thursday, as its sometimes known) the wicked queen had a fully functioning, if antiquated, Mirrors system and all was well in the kingdom. Then the humans hacked in and the system failed. Fairytales may never be the same again. Valhalla — (2000) Publisher: As everyone knows, when great warriors die their reward is eternal life in Odin’s great hall — otherwise known as Valhalla. But Valhalla has changed. It’s grown. It’s diversified. Just like any corporation, the Valhalla Group has had to adapt to survive. Unfortunately, nothing could have prepared it for the arrival of Carol Kortright, one-time cocktail waitress, currently dead, and not at all happy. Sparkling comic fantasy from one of Britain’s sharpest, funniest writers. Nothing But Blue Skies — (2001) Publisher: There are very many reasons why British summers are either non-existent or, alternatively, held on a Thursday. Many of these reasons are either scientific, dull, or both — but all of them are wrong. The real reason is, of course, irritable Chinese Water Dragons; of which estate agent Karen is one. Falling Sideways — (2002) Publisher: From the moment Homo Sapiens descended from the trees, possibly onto their heads, humanity has striven for civilization. Fire. The Wheel. Running away from furry things with big teeth. All would be testament to man’s ascendancy; if one man didn’t believe every civilization is actually run by frogs. Little People — (2002) Publisher: “I was eight years old when I saw my first elf”… and for unlikely hero Michael it wasn’t his last. Michael’s unfortunately (but accurately) named girlfriend Cruella, doesn’t approve of his obsession with the little people, but the problem is, they won’t leave him alone. Barking — (2007) Publisher: Monsters are roaming the streets of London. Of course, some monsters are scarier than others: Unicorns? Not a problem. Vampires? Big deal. Werewolves. Ho hum. Lawyers?… Aaargh! Duncan’s boss doesn’t think he’s cut out to be a lawyer. He isn’t a pack animal. He lacks the killer instinct. But when his best friend from school barges his way back into Duncan’s life, along with a full supporting cast of lawyers, ex-wives, zombies, and snow-white unicorns, it’s not long before things become distinctly unsettling. Hairy, even. The Better Mousetrap — (2008) Publisher: It touches all our lives; our triumphs and tragedies, our proudest achievements, our most traumatic disasters. Alloyed of love and fear, death and fire, and the inscrutable acts of the gods, insurance is indeed the force that binds the universe together. Hardly surprising, therefore, that Frank Carpenter, one of the foremost magical practitioners of our age, felt himself irresistibly drawn to it. Until, that is, he met Jane, a high-flying corporate heroine with an annoying habit of falling out of trees and getting killed. Repeatedly. It’s not long before Frank and Jane find themselves face to face with the greatest enigma of our times: When is a door not a door? When it’s a mousetrap. May Contain Traces of Magic — (2009) Publisher: There are all kinds of products. The good ones. The bad ones. The ones that stay in the garage mouldering for years until your garden gnome makes a home out of it. Most are harmless if handled properly, even if they do contain traces of peanuts. But some are not. Not the ones that contain traces of magic. Chris Popham wasn’t paying enough attention when he talked to his SatNav. Sure, she gave him directions, never backtalked him, and always led him to his next spot on the map with perfect accuracy. She was the best thing in his life. So was it really his fault that he didn’t start paying attention when she talked to him? In his defence, that was her job. But when ‘Take the next right’ turned into ‘Excuse me,’ that was when the real trouble started. Because sometimes a SatNav isn’t a SatNav. Sometimes it’s an imprisoned soul trapped inside a metal box that will do anything it can to get free. And some products you just can’t return. Blonde Bombshell — (2011) Publisher: Planet A has launched a smart missile at its mortal enemy, Planet B. The missile is fitted with a warhead powerful enough to reduce Planet B to sparkly dust, as well as a highly developed artificial intelligence to operate its guidance, targeting, reconnaisance and defence systems. Planet B doesn’t stand a chance. Two years pass. On Planet B (known affectionately by the locals as “Earth”), it’s business as usual. So what happened to the big explosion followed by sparkly dust? The smart missile, it seems, wasn’t quite smart enough. Rather than blowing up Earth, it is now living among its inhabitants — but at least it’s having fun. Indeed, having called on all of its comprehensive biological and cultural databases to project itself in an acceptable humanoid form, the missile has become the ultimate blonde bombshell. The missile (now a young, beautiful and well-adjusted member of the target species) has almost forgotten its past life. Until, one day, it tries to quit smoking. CLICK HERE FOR MORE BOOKS BY TOM HOLT.